Cast Size: Male: 5 Female: 5 Ensemble: 0 Total Cast Size: 10, but it can be expanded as needed to as many as you like. Recordings: Many. The original is okay. Film: 1973, starring Victor Garber, a flat rendition of a show that requires contact with its audience to work well. A good show for a young adult cast. High schools, especially Christian High Schools, have done the show with success. Colleges and Universities are well-equipped for this show. Small regional theater companies could do it, and it worked very well Off-Broadway. It is a very easy show to shoehorn into a busy season, so stock companies could well consider it. The subject matter is quite Christian. If that’s not your cup of tea, probably this show won’t be, either. This show also requires a strong directorial hand! The script needs gags and occasionally dialogue added into almost every parable, to make each production unique and unpredictable. I think this is an absolute must with this show. If you haven’t a Director with a good comic imagination to add in bits as needed, and develop unexpected performances that feel almost improvised, and fresh – this will not be a good choice. Also, this show gets done often. You may well need to check to see if it’s been done in your area in the past few years, before electing to produce it. ACT ONE: The show begins with the Voice of God declaring his supremacy: “My name is Known: God and King. I am most in majesty, in whom no beginning may be and no end.” The company enters and takes the role of various philosophers throughout the ages (often this section of the play is excluded). They sing fragments of their respective philosophies. (“Tower of Babble” (Prologue)). (In some productions, “Tower of Babble” is replaced by “Beautiful City”, which Jesus sings to open the show. In still other productions, the company cuts Tower of Babble and Beautiful City, opting to begin with “Prepare Ye (The Way of the Lord)”. In response to the philosophers, John The Baptist blows three notes on the shofar (a Hebrew horn made from a ram’s horn) to call the community to order. He then beckons them to “Prepare Ye (The Way of the Lord)”, and baptizes the company. Jesus comes, also to be baptized. John responds by, instead, asking to be baptized by Jesus. Jesus explains that it is not his place to baptize; that he has come to “Save the People”. As Jesus teaches of the law regarding the offering of gifts at the altar, the company makes offerings—themselves. They are taught that to approach the altar of God, they must be pure of heart and soul. Then, they act out the story of a master and a servant who owes him a debt. The servant asks his master for pity in repaying the debt, and the master absolves it. The servant then turns to a fellow servant who “owed him a few dollars” and demands that it be paid in full. The master, hearing this, then condemns the servant to prison. Jesus explains the moral: “Forgive your brothers from your heart.” The member of the company telling the parable sings “Day by Day”, and the company joins in. After the song, Jesus teaches that if one part of you offends God, it is better to lose it than to have the whole of the body thrown into hell. The company then plays charades to finish several statements posed by Jesus, including “If a man sues you for your shirt…” and “If a man asks you to go one mile with him….”. The company recites the Beatitudes. Judas, however, directs the final beatitude regarding persecution at Jesus, and Jesus quickly changes the subject. (“Did I ever tell you that I used to read feet?”) However, with this Jesus persuades the company that it is “All for the Best”; heaven contains the ultimate reward. Judas sings a verse, and the two do a soft shoe and a vaudevillian joke. The company, and chorus if used, join in the final verse (sung in counterpoint) to bring the song to conclusion. This is followed by the parable of the Sower of the Seeds, which Jesus tells them represent the Word of God. “All Good Gifts” is sung to further illustrate the point. ACT TWO: The second act opens with one or more cast members singing “Learn Your Lessons Well”, to call the audience back into the hall. Another member of the community sings “Turn Back, O Man”, in which she implores mankind to give up its temporal pursuits and to turn to God. At this point, several members of the community begin to question Jesus’s authority, and he responds with yet another parable. He is asked, “What is the greatest commandment?” and responds, “You shall love the Lord your God with all your heart and all your soul… And the second is like it: ‘You shall love your neighbor as yourself.’” The Pharisees continue to question him, and he laments “Alas for You”, and calls them hypocrites. Members of the community gather and join in his song, and throw garbage at the Pharisees. One woman is cast out as an adultress. Jesus says: “Let the one of you who is faultless cast the first stone.” Her accusers then bow their heads and walk away. Jesus walks over to her and asks: “Woman…where are they now? Has no one condemned you?” The woman answers: “No one, sir.” He tells her: “Then nor shall I. You may go, but do not sin again.” As she watches Jesus walk from her, she entreats him to remain “By My Side”. During this song, Judas foretells his upcoming betrayal of Jesus. In one of the lighter moments in the second act, Jesus tells how he will separate men as a shepherd separates his flock into sheep and goats. The sheep will enter heaven while the goats must suffer eternal damnation. “We Beseech Thee” cry the goats, begging for mercy. After the song, the community reminds each other to take things “Day By Day”, as they remove their clown makeup (or other accoutrement). They assemble for the Last Supper, and Jesus tells them that one of them will betray him. Each member of the community asks, “Is it I?” ending with Judas: “Rabbi…can you mean me?” Jesus tells him to do quickly what he must do, and Judas runs off. Jesus breaks the bread and shares the wine and tells his followers that they will dine together in the Kingdom of Heaven. The band sings “On the Willows”, which is about what has been sacrificed. In the song, Jesus says goodbye to the company members. He asks that they wait for him as he goes into the Garden of Gethsemane to pray. In the garden, Jesus implores God that if there is another way, to let the burden be lifted from his shoulders. Jesus returns to his followers to find them all asleep; he begs them to stay awake, but they all fall asleep again, and Jesus warns them they will all betray him three times (a reference to the apostle Peter). Jesus then prays to God that if his death cannot pass him by, then His will must be done. He is then tempted by Satan (usually played by the apostles), but orders him away. Judas returns to betray Jesus, but has a moment where he cannot bring himself to do it, but finds himself boxed in by invisible walls, except for one path which leads to Jesus. Jesus encourages Judas to do what he has come to do, and Judas grabs Jesus to bring him to be crucified. The community starts to attack Judas, while Jesus tells them to stop, as all who live by the sword will one day die by it. Judas (usually just him alone and as a representation of the others arresting Jesus) ties Jesus upon an electric fence – representative of the cross – as Jesus berates him for arresting him at night, but then says that it had to happen to fulfill the prophets’ writings. The “Finale” begins, loud and in B-minor, with Jesus wailing, “Oh, God, I’m dying,” and the community answers: “Oh, God, You’re dying.” Jesus dies and the music comes to a rest. The women of the company sing “Long Live God”, and the men join in with “Prepare Ye the Way of the Lord” in counterpoint, as they remove Jesus from the fence and carry him out (either offstage or through the aisles of the auditorium). As always, feel free to ignore or skip my opinions and ratings. And if you blow it, don’t blame me – just say the devil made you do it. Godspell is a fine show for a young cast to do, especially if they happen to be of a Christian bent. It is a reasonably respectful rendition of the Christ story (certainly at least as respectful as Jesus Christ, Superstar, if a lot more Milquetoasty than its early 70′s rival in the business of musicalizing the Gospels.). This is a show truly born out of the experimental “touchy-feely” movement in theater in the 1960s. It is an ensemble show just about built out of theater games that Viola Spolin would easily recognize. This, and the pop-rock score constructed mostly by Stephen Schwartz, do two things to Godspell. They give the show its unique energy and emotional power, and they date the show terribly. Today, I think it’s important to push front and center a story, a clear narrative that causes everything that happens. In the choreographic notes below, I try to isolate some of the elements that may help with this. The story is common knowledge, of course. Baptism, drawing in Jesus’ apostles, teaching them, the betrayal and crucifixion to be followed by the resurrection. These are the keynote actions that should be moved unerringly toward, inevitable and virtually ritualistic. The “hippy” qualities – the make-up and costumes and sets of the original production, along with the sense of a hive mentality, all for one, should be de-emphasized in my opinion in favor of the creation of ten distinct, interesting characters, each with a life of their own, and their own unique way of plugging in, and withdrawing. Judas would, of course, be the most “individual” of the apostles. This will allow the audience to decide for themselves who they identify with – and the more unique each character up there is, the more luikely it will be that each audience member will find someone up thee a little like himself. The fact that the characters join for this trip through life should not mitigate that they are each unique, alone with their own conscience and capable of singular action. I think the early 70′s approach is really hard to swallow in this post-Me-generation age we live in. How it is. I also feel strongly that this show always requires a very strong does of theatrical fun. It can quickly grow maudlin with some of the more liquidy ballads, and really needs a theatrical flow of blood in its veins. But it can be great fun to do and to watch, and a deeply moving experience as a show – when done very creatively, smartly, and well. A rock-pop score idiomatic of the period in which it was written, laced with folksy sounds. Requires a Musical Director who is facile with pop styles of the period, as well as some theatrical “show” styles like Vaudevillian soft-shoe. An energetic score, your musicians will need the energy to get through it each night. The score is rich with sung harmonies. Given the overall simplicity of design of the orchestrations and the songs, the harmonic content should be very well and even beautifully executed, it’s a must. Cast for the ability to harmonize, to learn harmonies and to blend effectively. And make sure you cast across the vocal spectrum. Jesus – Rock tenor with a crystal clear voice, ringing high notes, a decent belt. Very emotional expression required. John The Baptist/Judas Iscariot – Lyric baritone, not a heavy quality, a clean, clear delivery of lyrics. The Apostles – 4 men and 4 women. All must have rock belts and strong mid-ranges. All must harmonize very well, using pop-style harmonies. Godspell requires a lot of high-energy, joyous movement. Each song in the show has a prevailing “mood” that will need to be figured out and then actualized in movement. This is not typical Fosse-like “Broadway” dance, but is rather more influenced by gospel, folk and religious ritual. But it needs Broadway-type energy. It should feel (don’t take this wrong) “sexless”, generally, compared to most Broadway choreography. It’s energy, instead, derives from a sense of having an immediate experience, of something wondrous happening right now, and participating in it in a way that assumes a life of its own. A Choreographer is likely to need to help stage “Tower of Bable” (if not cut), “Prepare Ye The Way Of The Lord”, “Save The People”, “Day By Bay”, “Learn Your Lessons Well”, “Bless The Lord”, “All For The Best”, “All Good Gifts”, “Light Of The World”,“Turn Back, O Man”, “We Beseech Thee”, and the finale. That’s most of the score, and a lot of movement. “Tower of Babel” presents the actors standing as if statues, generally, spouting noise and philosophy as if it is just noise. (A ridiculous way to treat some of the greatest thinkers and thinking in mankind’s history, really, and juvenile.) Personally, I would (and did) cut it and started with “Prepare Ye…” If you keep Babel” in, it should represent a human world spinning a bit mad, noisy, cacophonous. If each “philosopher” had their own corner soapbox, as it were, and moved about the audience selling their ideas, it would work better. It can all suddenly stop with the entrance of John, blowing on the ram’s horn. Blowing the ram’s horn, or “shofar”, is a traditional ritual in the Hebrew faith, and a reminder that Jesus was, well, Jewish. It is a summons in this case to become Baptized, again a ritual some ancient Jewish sects utilized before there was a Christianity. The number should demonstrate the cast becoming baptized, perhaps, cleansed in water to some extent,. Or at least a few of the more willing members. (Keep them dressed, do not “immerse” anyone! Use a squirt gun, it will fit right in with the show.) The number is a call to join in, to participate, and could not be musically more simple or redundant. It is all about energy, about Gospel music, about clapping hands and fingers reaching for the sky, as a rule. “Save The People” is a solo wherein Jesus seems to speak to his Father, asking when the prophesies of a savior will be fulfilled. But of course, he is that fulfilled prophesy so far as the show and Christianity are concerned, and he’d know that. And when he speaks of the people to be saved, he is accepting each of the apostles into his circle, and the audience by extension. The number should obviously focus on Jesus, his words, his actions, and they should invite the audience and other actors into his circle of privacy, a large circle and an inclusive one. “Day By Day” is the hit song, and again, like “Prepare Ye’”, very simple and repetitive. It starts gently, with a motion like tidal waves, steady and inviting. It is a statement of complete devotion, every day, but cannot be “acted out” or demonstrated as such. It relies, instead, on a sense of joy, the joy of belonging to something larger than one’s self (these characters see that as joyous). The problem you’ll start to run into here is how not to do gospel happy hands and the rest with a second number in close order, to be followed soon by several others that seem to demand a similar approach. So it will be critical to decide on a central action for each number, something being done, that will isolate the number and make its movement and sentiment unique. (Because, in truth, this is one of the most repetitive and simplistic of scores for a successful show – a bit too much so for good dramaturgy.) Here, perhaps an offering unto God, a flower, a lock of hair, a small square of a person’s clothing torn off, a shoe (could be funny, even), all placed into Jesus’ hand with love, as if they are each giving him a part of themselves to hold in trust. (After a moment, he could return the shoe…) And he would accept it all in his Father’s name with grace and affection. “Learn Your Lessons” is more of a show tune, and should be comic. A blackboard, a “harsh” teacher without humor juggling the apples her hopeless students gift her as she teaches, some central gag demonstrating the need for diligence in life and in study. Cast one of your funnier actresses in this role, keep her center of the number. “Bless The Lord” is a full-blooded, loud-throated declaration of commitment. Unfortunately, the sentiment is close to “Day By Day”. Angle it where the lyric takes you, a “thank you” to God for the gifts he has given these characters (as they see it). It isn’t Gospel, though, it’s a bit closer to rock, edgier, faster, more aggressive, more “Broadway.” The dance can be more athletic, more open and full floor. “All For The Best” is a relief and a very welcome one in the score, if you ask me. (And even if you don’t ask me.) It is a vaudevillian hat-and-cane soft-shoe tap-ish number for Jesus and Judas, with Judas given a clever, energetic patter verse. Go for schtick, and pure show-biz. Certainly the most fun number in the show. “Light Of The World” is a high energy rock number, kind of funky and edgy and with a growl. It is intended to end the act with a bang. It is aggressive, and should be played out in the audience’s face to some extent. It isn’t “danced” as much as preached. And it demonstrates the sort of idol-worship that later (and now) starts to worry Judas, and should do so clearly with Jesus being idolized by the rest of the cast. “Turn Back O Man” is a Marilyn Monroe – Mae West – Belle Star lampoon, and though the young lady dances with a boa (as we did it), it is actually rather sexless, all in fun, a lampoon of sin intended to make it look awkward, graceless, even goofy and unappealing. So her come-ons and sexual exploits should fail miserably, she should be gawky and awkward, and entirely comic. Use your strongest comic actress here, and she must have a belt voice. “We Beseech Thee” is a pseudo-country western reel. It is almost a hoe-down in feel, and that is an excellent way to use it. We even had cast drag audience into the dance, and they loved it. I hope. Too late now, if they didn’t. But the number always stopped the show. Pull out every hoe-down step you can think of, high-kicking and energy is required. Treat this like an 11:00 number, rousing as it can get, waking up the audience for the end of the show. Have your cast leave it all of the floor. The finale of the show is built around Christ’s death, and the image of the cast carrying his body (and his ideas) with them, out of the theater and into the world at large. It is a ritual, simple, stately even as the music rocks. A slow march, almost funereal, but colored by the fact that the cast is exultant, they have their marching orders, their mission. Make sure your cast can sing and dance with equal skill! Jesus – Young (early 20s-late 20s), charismatic, energized, committed. A quality of innocence, almost naivete, mated with a fascination for the world and for the actions of people. Able to project affection and love for others easily and compellingly. And good at schtick, funny, genuinely amusing. Cast for voice, type, acting, movement. Must do all well. John The Baptist/Judas Iscariot – Perhaps a bit older than Jesus, in his mid 20s-early 30s. As John, a single song is sung, basically, but it must ring out true and strong, with commitment. As Judas, more worldly, a darker view of life. Requires a capable and interesting, even quirky actor who is not unappealing or “evil.” Cast for type, acting, voice, movement. The Apostles – In their late teens-early twenties. All energetic, strong comic actors. Unusual types, but easy to watch. All must have easy, ready access to emotions, especially tears, grief, and joy. All must be able to communicate those emotions compellingly. All must dance quite well. All must sing quite well. Cast for voice, type, acting, dance, but you’re looking for a lot of triple threats. Ideally, several of them would play instruments, at least guitar. I frankly don’t see anything wrong with it taking place on a “bare stage”. It is clearly “theater”, why hide it? Lower the light grid, let the audience see the instruments. Place a riser or two on the stage for levels. Or play it all on the steps of a church, like a Medieval Miracle play. It could use the wagon such shows used, and be performed in a town square, or an outdoor auditorium. 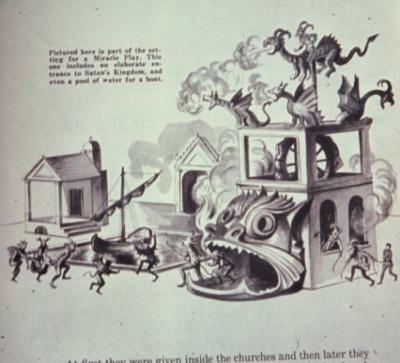 Or the wagon could role onto a stage that is dressed up like a park or a church, and the performers unpack and perform, then at the end, ride off carrying the body of Jesus with them, even up the aisle, the wheeled wagon dragged by a few of the men. I think this approach is appealing in its simple,. Almost improvisational feel, and obvious theatricality. Key to your decision making regrading the set is the concept the Director elects to go with. Close consultation should occur during the designing of the set. And there will need to be lots of open room for dance and song. There’s only one set, and it should not be complicated or expensive. It is not a major factor in the success of productions of this show, or has not been to date. But do select an approach. Usually the cast is almost dressed like clowns who have picked up clothes haphazardly off other people’s clotheslines. The clothing is bright, and sometimes ill-fitting, and two pieces rarely go together in a coherent fashion statement. And Jesus wears a Superman T-shirt, with the big “S” on it. Judas is often isolated by placing a long, dark overcoat on him (very hot for a musical requiring exertion of this kind). I think this approach is worn out, and helps date the show. I think a new approach should be devised, aligned with an interesting set design. Perhaps the entire piece is post-apocalyptic, and the actors wear rags that once were everyday, decent clothes. (Eh.) 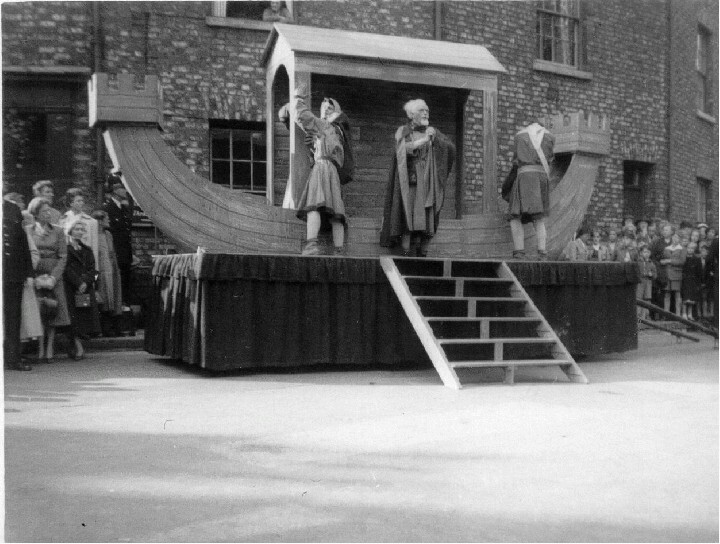 Or perhaps they are a performing troupe (the wagons) with clothes pieced together from other shows such as mystery and morality plays. Or from modern shows, everything from Hello, Dolly to Sweeney Todd to Les Mis. Could be some fun sight gags! Or they fit right in with ancient Jerusalem, and then you can borrow costumes from the last local production of Jesus Christ, Superstar. Or they’re clean-cut college types, longing for adventure. The approach will need to be conceptualized with other designers and your Director. But each actor only needs one costume (except Judas, and when he transforms, it should just require adding something, or taking something away.) They must be able to breathe, to dance and sing a lot. And I’ll bet whatever your approach, most of what you need will be found in closets and thrift stores. Not too hard a job. Lots of props, some expendables like confetti. Guitars, tambourines, other instruments – probably supplied by the cast. Each parable is likely to require specialized props. Work closely with your Director! Treat this like broad, bright Musical Comedy, which for the most part it is. Moods change often, and suddenly. Your lighting will need to be emotionally fluid. You may want two spotlights for “All For The Best”. Comedy numbers should pop. Try to avoid concert-like lighting for the pop ballads, it will isolate them as though they are not part of the show. Um, well, clown make-up is typical, with a single black tear painted on Jesus’ cheek. I wouldn’t go that route if I could help it, I think it’s worn out. The whole God or angel or Christ-as-clown idea had been played with earlier, even by such grand and important plays as J.B. I would rather place them in no discernible make-up today, and let the audience see their faces. The whole face-painting thing was very “Hippy,” and really meaningless today. If you go the Mystery Play route, you might use masks that can pop on and off for parts played in the parables. That would be an expensive, time-consuming approach requiring extra rehearsal to get right as well. Not a great idea, but it would differentiate your production from the thousands of others. Director, Musical Director, Choreographer, Jesus, Judas. This is a very high energy show, a young actor’s show. High Schools do it, colleges do it, young theater groups do it, often in churches as well as theaters. It is a religious experience for some, fun theater for others, and it should probably always be a bit of both in equal measure.